NASA's Jet Propulsion Laboratory in California has some of the wildest Halloween pumpkins each year as part of a holiday contest. Case in point: This amazing Mars-themed entry from this year's contest. If you're like me and take Halloween seriously, then a space-themed pumpkin is a must-have treat. The engineers and scientists at NASA's Jet Propulsion Laboratory in California think so, too. In fact, they have a contest each year to see which NASA team can dream up the best pumpkin work of art and this year's entries — which light up, spin and move — are simply out of this world. Halloween is a special time for JPL, which was founded on Oct. 31, 1936. That means that in addition to tricks and treats, JPL is celebrating its 80th birthday today. This towering pumpkin birthday cake creation celebrates that anniversary with spooky style. JPL's Team 352C went retro for its pumpkin entry this year, dreaming up an awesome gourd version of Ms. Pac-Man chomping on ghosts (as you can see below). I hope its spooky entry number "13" wasn't too unlucky in the competition. In July, NASA's Juno spacecraft arrived at Jupiter — and why not celebrate that planetary feat with a pumpkin fete? That's what's happening in this stunning entry, which features a pale pumpkin version of Jupiter's icy moon Europa (complete with water plumes) while Juno orbits Jupiter in the background. It's no surprise that pumpkin pie is popular this time of year, but Pumpkin Pi? This JPL entry takes a mathematic look at our favorite Halloween decoration. If pumpkin mayhem is more your thing, this stunning entry (which NASA titled "Just a scratch") shows what just might happen if a gourd met the business end of JPL's Starshade project, which aims to build a vast, flowerlike shade in space to aid in the search for alien planets. Around and around this next entry goes, where it stops only the pumpkin knows! Welcome to NASA's Halloween carnival, in pumpkin form. The Juno Jupiter probe makes another appearance in this next entry, along with a hauntingly painted pumpkin in place of the gas giant planet and some stunning light elements. I suspect they represent the harsh radiation environment Juno experiences. And now for something creepy. What lurks within the heart of this next pumpkin? Something weird to say the least. 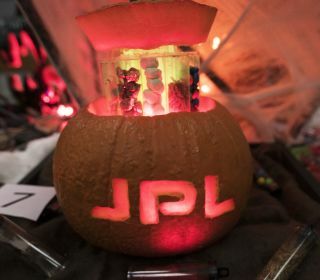 This "Lights out" entry is a "reluctant pumpkin" that seems not to want anything to do with JPL's contest, according to NASA. Last, but certainly not least, we have the obligatory UFO pumpkin conducting its own "sample-return mission" before heading back to the Red Planet. I hope that cow can find its way home! NASA called this one "Abduction by pumpkin." And that's a wrap for NASA's awesome space pumpkins from JPL's 2016 contest this year. They certainly put my Apollo 11 moonwalking pumpkin to shame, but in all fairness I did use a NASA template. I hope you found some inspiration from NASA's images and videos, and have a very happy (and space-y) Halloween!